This report is aimed at those in IT leadership and Software Asset Management with a strong background and interest in software licensing. 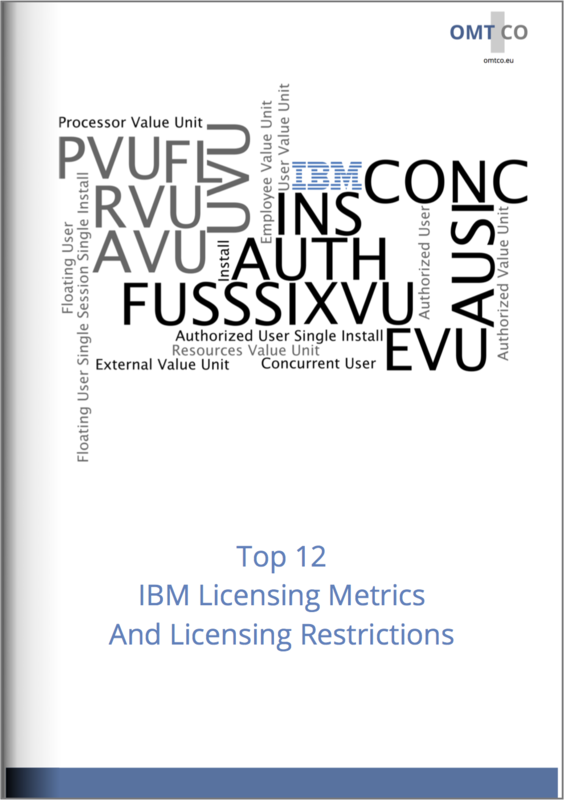 The report analyses IBM’s twelve most common licensing metrics and their associated licensing restrictions. We give valuable advice and direction to IBM customers on how to deal with the challenges of IBM’s product diversity and complex licensing. Chapter (I.) presents an overview of IBM’s main metrics. IBM differentiate their metrics into two categories, capacity-based (hardware) metrics and user metrics. We present examples of products from the IBM brands WebSphere, Tivoli, Lotus Notes, SPSS, Rational, Informix and FileNet. Different editions and versions of the same products are analyzed. Chapter (II.) presents capacity-based (hardware) metrics. Current capacity-based metrics include Processor Value Unit (PVU), Resource Value Unit (RVU/PVU) and Install. We show examples of IBM products using these metrics and their licensing restrictions, such as IBM WebSphere MQ or IBM TAD4D. Chapter (III.) presents user metrics. Current user metrics include Authorized User (AUTH), Concurrent User (CONC), Floating User (FL), and variations of User Value Unit (UVU), such as Authorized Value Unit (AVU), Employee Value Unit (EVU) and External Value Unit (XVU). We show examples of IBM products using these metrics and their licensing restrictions, such as IBM Lotus Notes, IBM SPSS Statistics or IBM Informix. Should you have any questions, please contact OMTCO; contact details are listed at the end of this report. For those executives interested in sharing their thoughts on licensing, Software Asset Management or compliance audits, we highly welcome your feedback and comments. Understanding the metrics applicable in the licensing of a specific IBM product installation is crucial to determine the Technical Usage and the License Demand. The License Demand is derived from applying the relevant licensing metrics and restrictions to technical installations. In the following technical report, we present the most common IBM metrics, with product examples. These metrics are used in combination with diverse software usage options, such as Indefinite Use (perpetual license) and Fixed Term License (FTL) for distributed environments, and Software as a Service (SaaS) for software provided by IBM in a hosted environment. Each of these options may set further licensing restrictions. IBM customers should be aware that these examples are for information and illustration purposes only. The licensing of products depends on the edition and version in use. In this report, we show selected aspects of the licensing of selected editions and versions. Always refer to the applicable IBM Program Announcement Letters (PLETs) and Licensing Information (LIs), and to your individual customer agreements, to take into account your specific customer situation. IBM WebSphere MQ, in productive or development environments, is licensed per Processor Value Unit (PVU), for instance with license D55V1LL, whereas idle servers may be licensed with less expensive licenses, such as IBM WebSphere MQ Idle Standby (D0GGQLL, costs 20% of the price of productive environments). The advanced edition, IBM WebSphere MQ Advanced, is also licensed per PVU but with a different license (D0V1DLL), and again, an idle server may be licensed at a lower price (D0V0XLL, IBM WebSphere MQ Advanced Idle Standby). Some further MQ products are licensed using other hardware metrics: IBM WebSphere MQ Telemetry is licensed per Install (D0PJTLL), whereas the advanced edition, IBM WebSphere MQ Telemetry Advanced, is licensed per Client Device (D0D6HLL). Some are licensed using complementary metrics: IBM WebSphere MQ Managed File Transfer Service is licensed per PVU (D0PJZLL), and the agents, IBM WebSphere MQ Managed File Transfer Agent, are licensed per Client Device (D0PKULL ). WebSphere MQ products have always been simple to license. Their restriction is associated with the server (productive/development vs. idle/standby) and the edition (normal vs. advanced edition). The licensee must license the program directly (the TAD4D server installation) and the resources managed (all servers with TAD4D agents). The unit of measure of licenses is PVU. Therefore all resources, the main server and the servers managed, must be licensed per PVU. RVU = (PVU of the TAD4D server) + (PVU of the managed resources). For this product, PVU is subject to a licensing obligation (variation) penalizing Full Capacity customers: all cores available for use in a physical or virtual server must be licensed, regardless of whether the capacity of the processor core can be, or is, limited through virtualization technologies, operating system commands, BIOS settings, or similar restrictions. Therefore even non-usable cores, deactivated, etc., must be licensed. IBM Tivoli Netcool Omnibus Base is available licensed per install (at cost of EUR 27k (BL) per install). An Install is an installed copy of the Program on a physical or virtual disk made available to be executed on a computer. The licensee must obtain an entitlement for each Install of the Program. Much IBM software is bundled with the base installation, for instance, IBM Tivoli Monitoring Version 6.2.2, IBM Tivoli Netcool/Impact Version 5.1.1, eWAS (embedded version of IBM WebSphere Application Server) 7.0, IBM DB2 Workgroup Server Edition Version 9.7, IBM DB2 Enterprise Server Edition Version 9.7. None of these installations require a license, as long they are only used in relation with the Tivoli Netcool Omnibus Base installation. This product is licensed per authorized user. The licensing requirement states that licensee must acquire a PoE for each unique individual (each person) accessing the Program or any component, directly or indirectly, through any means on behalf of such individual in any manner. Each PoE includes a Client Access License (CAL) for that individual, which provides the individual with the right to connect and interact with an IBM Lotus Domino Server. Licenses may not be shared by persons, but may be transferred from one person to another if there is an exogenous reason why a person does not need a license any more (person leaves the company, retires, etc.). These transfer of licenses may not cover non-permanent transfers, such as holidays, sick leaves, etc. (Limited) secondary use rights: The Program may be stored on the primary machine and another machine, provided that the Program is not in active use on both machines at the same time. This means that a user with three computers never running at the same time, such as a desktop and laptop at the office and a home computer, needs two CALs. A user with two computers running at the same time also needs two CALs. IBM SPSS Statistics (any edition) may be licensed using Authorized User (AUTH) or Concurrent User (CONC) metrics. In the case of licensing using CONC: A Concurrent User is a person who is accessing the Program at any particular point in time. Regardless of whether the person is simultaneously accessing the Program multiple times, the person counts only as one Concurrent User. The Program may be installed on any number of computers or servers, but the licensee must obtain entitlements for the maximum number of Concurrent Users simultaneously accessing the Program. All access means, direct or indirect (multiplexing, application server), must be counted. In the case of CONC licensing, a so-called FLEX server may be used to measure and constrain parallel access – and if so, the concurrent usage may be exported from the FLEX server (if not, the customer must demonstrate the high watermark for CONC usage). Grad Packs/Faculty Packs/Author Packs may not be used by persons other than students/persons in faculties (education)/writers. They may not be used in a commercial environment. Campus Edition, Academic Authorized User, and Academic Concurrent User may only be used in education, and not in a commercial environment. An IBM Rational Floating license is a license for a single software product that can be shared among multiple team members; however, the total number of concurrent users cannot exceed the number of Floating licenses purchased. For example, if you purchased one Floating license for an IBM Rational product, then any user in your organization may use the product at any given time. Any other person who wants to access the product must wait until the original user logs off. Rational does not currently offer a Floating Fixed Term License. To use Floating licenses with most Rational products, you must obtain Floating license keys and install the IBM Rational License Server. This server responds to end-user requests for access to the license keys (it distributes license keys to clients); it will grant access to the number of concurrent users that matches the number of licenses the organization purchased. The Program may be licensed per Authorized User Single Install (AUSI). An Authorized User is a unique person who is given access to the Program. An Install is an installed copy of the Program on a physical or virtual disk made available to be executed on a computer. The licensee must obtain separate, dedicated entitlements for each Authorized User accessing the Program on each Install in any manner directly or indirectly (via multiplexing, a device or an application server). An entitlement for an Authorized User is unique to that Authorized User and may not be shared, nor may it be reassigned other than for the permanent transfer of the Authorized User entitlement to another person. Any computing device that requests the execution of – or receives for execution – a set of commands, procedures, or applications from the Program or that is otherwise managed by the Program is considered a separate User of the Program and requires an entitlement as if that device were a person. Install limitations: If Program is licensed per Authorized User Single Install (AUSI) or per PVU or per Concurrent Session (CS), the Program may only be installed on a server <= 4 Sockets and may only use <= 16 cores. Where a physical, logical, or virtual partition is used, it must be created with an approved IBM eligible partitioning technology. Floating User Single Session Single Install is a unit of measure by which the Program can be licensed. A Floating User is a person who is accessing the Program at any particular point in time. If the person is simultaneously accessing the Program multiple times, either on the same or on multiple computers, each separate simultaneous access counts as a separate Floating User. The Program may be installed on any number of computers or servers, but the licensee must obtain entitlements for the maximum number of simultaneous Floating Users for each installed copy of the Program. The licensee must obtain an entitlement for each simultaneous Floating User accessing the Program in any manner, directly or indirectly (for example: via a multiplexing program, device, or application server) through any means. For 1 to 5,000 Users, 1 UVU per User. For 5,001 to 15,000 Users, 0.5 UVU per User. The maximum scale effect is reached at 3 million users. Example: if 20,000 users are using the program, the number of licenses is: [5,000 X 1] + [(15,000-5,000) X 0.5] + [(20,000-15,000) X 0.3] = 11,500 UVU licenses. There are many bundled components: IBM DB2 Enterprise Server Edition (several versions), IBM Tivoli Directory Server (several versions), IBM JRE for Multiplatforms Java Technology Edition V6.0, IBM WebSphere Application Server Network Deployment v7.0, IBM MQEveryplace 2.0.2.12. All bundled components are associated with restricted use rights. IBM FileNet Content Manager may be licensed with various UVUs, depending on the user type: FileNet CM Authorized is licensed per AVU (Authorized Value Unit) or Infrequent AVU, FileNet CM Employee is licensed per EVU (Employee Value Unit), FileNet CM External is licensed per XVU (External Value Unit). Scale effect tables are associated with each user type. Authorized Users are unique persons given access to the Program (directly or indirectly). Infrequent Users are users who access the Program <120 times in any consecutive 12 months (one single access = all accesses within consecutive 15 minutes). An Employee User is a person employed in the licensee’s enterprise (all employees must be licensed). An External User is a person, not employed in or acting on behalf of the enterprise, and given access. (table continues). All other metrics have their own table – ask OMTCO for more details. The main restrictions are associated with the definition of user types, employees, externals, etc. Some user types have licensing restrictions, for instance in the EVU (Employee) metric, all employees of the enterprise must be licensed (employees of acquired companies must be licensed too). We have discussed metrics and restrictions associated with selected IBM software products. Capacity-based (hardware) metrics and user metrics are many and varied, each with various requirements and licensing pitfalls. The metrics and the requirements associated with the licensing of IBM products must be understood in order to determine the License Demand. The License Demand of one specific IBM installation is calculated by applying one of the permitted metrics and its licensing requirements to the Technical Usage of the IBM installation (refer to previous publications by OMTCO to understand the path from Technical Usage to License Demand). 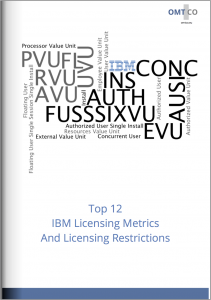 IBM metrics and licensing requirements – and hence the licensing pitfalls – are diverse and varied. The metrics are partly detailed in the applicable IBM Licensing Information documentation (LI) and Program Announcement Letters (PLET). Additional information needs to be obtained from further IBM licensing documentation, such as PVU counting rules, requirements of Sub-Capacity, etc. The role of the Software Asset Manager is to understand the full spectrum of metrics and licensing requirements applicable to their IT assets. In doing so, they permit their IT leadership to optimize assets, capital and operating expenditures. We recommend customers to seek assistance from IBM product and licensing experts, augmented by IT infrastructure understanding, to ensure that the metrics and licensing requirements are fully and correctly determined. OMTCO’s IBM product and licensing expertise, supplemented by knowledge of IT infrastructure, ensures competence above and beyond practical requirements. Should you wish for advice tailored to your specific needs, please call your OMTCO representative directly or contact OMTCO at ibmlicensing@omtco.de. OMTCO does not disclose clients’ names, client projects or data. The case study and data published in this report is generic and derived from years of compliance reviews. All analysis presented and information disclosed in this document are exclusively based on public information. Should you wish to learn more about our confidentiality practice or about this case study, please contact an OMTCO representative. THE FINDINGS OF THE REPORT DEMONSTRATE THE IMPORTANCE OF ANALYZING THE APPLICABLE IBM METRICS OF SPECIFIC INSTALLATIONS IN A STRUCTURED APPROACH, SUPPLEMENTED BY IBM LICENSING EXPERTISE. WHEN YOU CONDUCT AN INTERNAL COMPLIANCE REVIEW, OR WHEN AN IBM AUDIT CONFRONTS YOUR ORGANIZATION, OMTCO IS BY YOUR SIDE TO PROVIDE YOU WITH LICENSING EXPERTISE, COUNTER-AUDIT EXPERIENCE AS WELL AS NEGOTIATION SUPPORT. OMTCO provides its clients with the best, thought-out advisory and line services, ranging from design-stage to implementation in Operations, Management, Technology and Consulting. OMTCO works with the highest possible level of expertise – taking into account our know- how and our pragmatic experience from market analysis, competitive projects and professional references. OMTCO has licensing expertise at its disposal, in addition to extensive experience in compliance reviews and customer-sided counter-audits. Should you wish for advice tailored to your specific needs, raise comments or ask questions, please contact OMTCO at info@omtco.de or call your OMTCO representative directly. This document is current as of the initial date of publication and may be changed by OMTCO at any time. Not all offerings are available in every country in which OMTCO operates. THE INFORMATION IN THIS DOCUMENT IS PROVIDED “AS IS” WITHOUT ANY WARRANTY, EXPRESS OR IMPLIED, INCLUDING NO WARRANTIES OF MERCHANTABILITY, FITNESS FOR A PARTICULAR PURPOSE AND ANY WARRANTY OR CONDITION OF NON-INFRINGEMENT. This report is for information and illustration purposes only. It is not an advisory document and does not take into account your specific customer situation. Please refer to the disclaimer published at http://omtco.eu/disclaimer. © Copyright 2019 OMTCO. All Rights Reserved.